To honor the legacy of the historic site, our intent is to restore the landmark building and activate it via a dynamic array of public programs and immersive experiences. By 2020, we are seeking to address the following critical projects, which range from phase I of a major restoration initiative to implementing enriching and educational visitor experiences. New Day at Federal Hall reimagines the site as a premier American cultural heritage destination in the heart of downtown Manhattan for New Yorkers as well as the 15 million annual visitors to the area. Along with replacing outdated permanent exhibits, we will explore the ideas, ideals and contradictions of American democracy, as uniquely forged here at Federal Hall, through the creative arts and humanities. 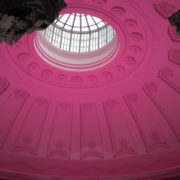 Planned cornerstone programs include: immersive visual arts installations; discussion programs such as Freedom Forums and the American Presidents; site specific theatrical works, The Democracy Project; and a curriculum-based school program, the Federal Hall Youth Congress. Grand Rotunda. The Grand Rotunda is one of the most majestic interior landmarks in New York City. Modeled on the Roman Pantheon, it features a soaring 60-foot illuminated saucer dome and oculus supported by grand Corinthian columns. After decades of deferring maintenance, the once grand room is in dire need of repair. Our goal is to secure the dome from moisture, restore all surfaces and install new audio/video technology, which will enable it to be used as a premier space for our cornerstone programs. Chamber Rooms. Around the Grand Rotunda are four Chamber Rooms with vaulted ceilings and oversized windows, offering spectacular vistas of the iconic statue of George Washington and the New York Stock Exchange. 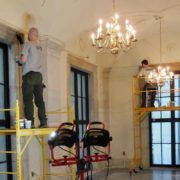 The Chambers are in dire need of stone cleaning and repair as well as a full scale restoration of the century old windows. 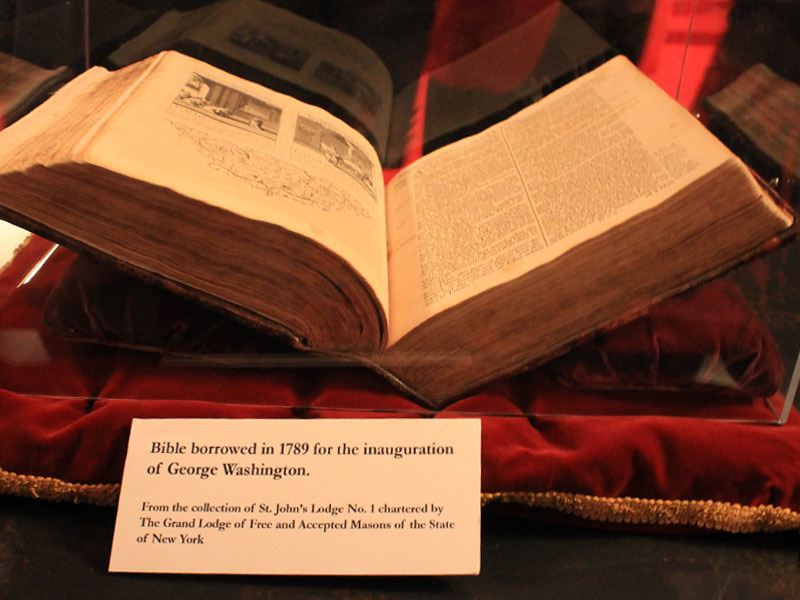 Once restored, these spaces will feature exhibitions of rarely displayed documents and artifacts as well as artists commissions illuminating the four firsts of the historic site—First President, First Congress, First Capital and First Freedoms. People’s Gallery. With floor to ceiling windows, magnificent vaulted ceilings and Greek Doric columns, the 1,500 square foot gallery is one of the largest spaces for visitors to congregate on the main level. Our restoration efforts here focus on reclaiming the marble floor, removing poorly sited systems and much needed stone cleaning. Once conditions are improved, this space will showcase the global interconnectivity of democracy today featuring the work of digital artists as well as the everyday stories of the public. Visitor Orientation Center. Mirroring the People’s Gallery in scale and grandeur, the National Park Service rangers welcome visitors here and offer free building tours and information on the city’s other national parks. Restoration will clean stone elements and make accessible the views from the historic windows. This gallery will be the gateway to Federal Hall as well as to downtown heritage tourism for millions of national and international visitors. Founders Corridor. 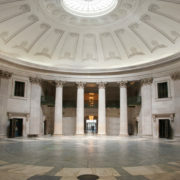 This marble expanse forms a ceremonial portal to the Grand Rotunda. Importantly, it is also the ADA accessible entry for visitors. The Founders Corridor requires modernization of ADA systems and an upgrade to vestibule areas. Once renovated, the Founders Corridor will also feature mixed media and digital tools for visitors to experience other spaces throughout the site. Exterior Restoration. 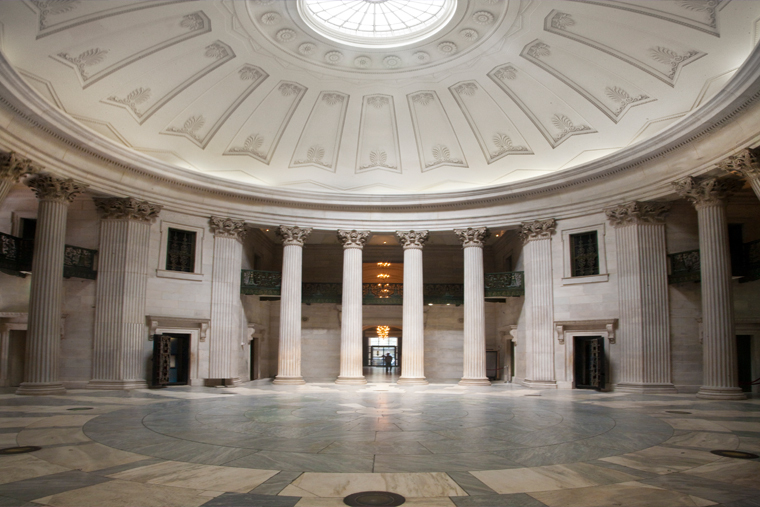 Federal Hall is one of the finest examples of Greek Revival public architecture in America. After decades of deferred restoration, the façade today is a shadow of its former glory. Already we have addressed one critical issue which was the repointing of the leaking Wall Street steps. Our ultimate goal is to clean the entire facade, repair stone features, install architectural lighting and address wildlife issues that threaten preservation of the landmark. Restoration of Wall Street Steps. The iconic front steps of Federal Hall have long served as America’s soapbox. From war bond and political rallies to Occupy protests, the symbolism of the site where the Bill of Rights was passed and the majesty of the setting have made these steps the platform of choice for debate, dissent, dialogue—and crowds. In quieter times, these steps are also a magnet for tourists and for Financial District workers on their lunch break. Such heavy use has taken its toll. George Washington’s perch is listing, granite has fallen away and joints have failed. The steps are urgently in need of repair. Fortunately, we secured the support of American Express and the National Trust for Historic Preservation to restore the steps and return America’s front door to glory. The restoration work was completed in 2017. New Rotunda Lighting. Inadequate natural light and outdated fluorescent bulbs had for many years diminished the majesty of the saucer dome. 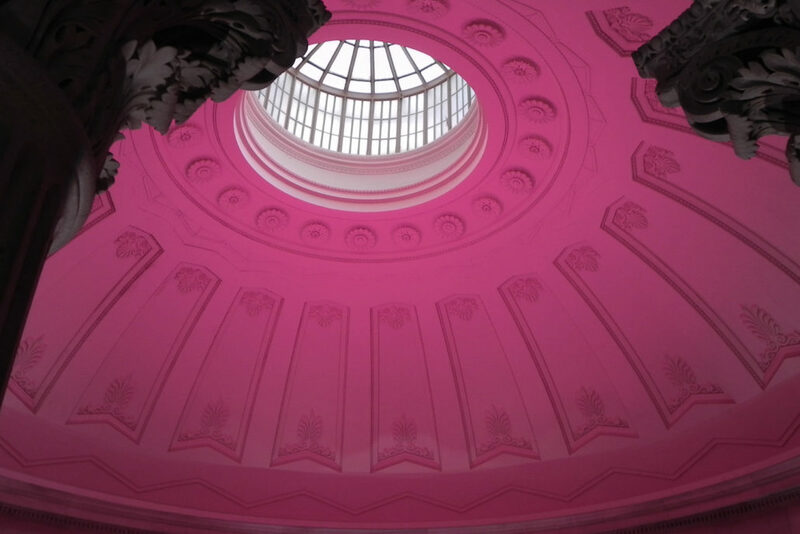 Through a generous donation from Philips, we relit the rotunda with the latest in LED Color Kinetics technology, improving the aesthetics for visitors and contributing to the energy efficiency of the site. Survey of Historic Interior. Decades of use without major repairs have left its mark on the historic interior. Much of the deterioration, such as loose or cracked pavers and soiled marble, is readily visible on a casual walk-through. But planning the restoration demands more than casual observation. A thorough—and expert—inventory of the damage is necessary. A grant from the New York Community Trust made that possible. 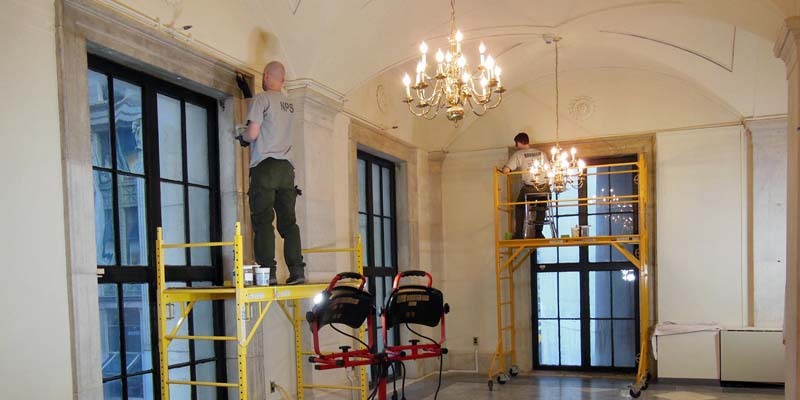 The recently completed pilot restoration and survey of the building’s marble and glass elements by the National Park Service preservation team, assisted by Schnabel Conservation, will allow us to scope out the work that is required, budget for it and raise the funds. 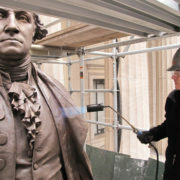 Restoration of Statue of George Washington. Presiding over Wall Street for over 130 years, the iconic John Quincy Ward statue of George Washington has weathered stock market crashes, attacks by anarchists and in recent years, the affectionate attention of visitors. In many places, the black lacquered patina wore away to the bronze beneath and in others, obscured the finest sculptural details. 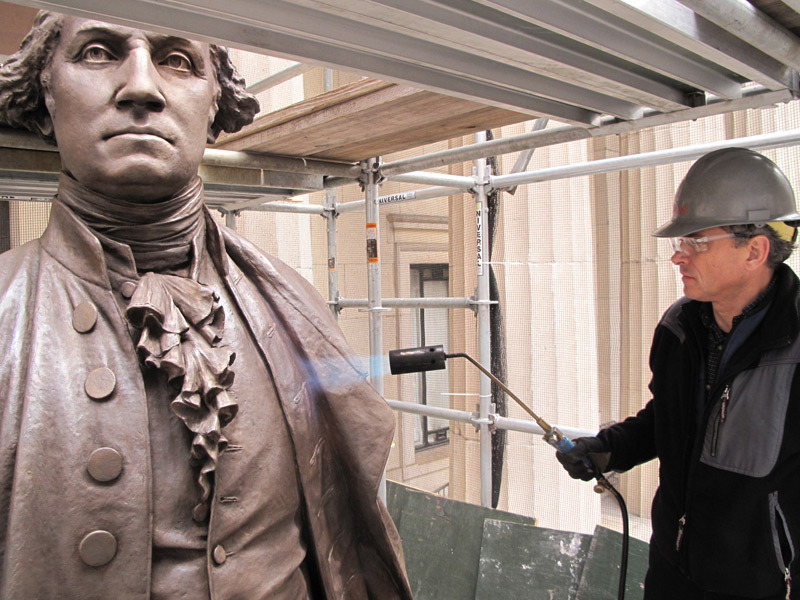 With support from American Express and the National Trust for Historic Preservation we restored the statue, stripping away years of grime and heavy-handed interventions with state-of-the-art laser technology and allowed the sculptor’s work to shine by coating it with a lighter brown protective patina. Cataloging and Digitization of Collections. 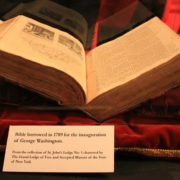 Federal Hall’s collections and those of other Manhattan historic sites were moved to Staten Island when the site closed for repairs after 9/11. With support from the Leon Levy Foundation we were able to improve storage conditions, catalogue documents and artifacts and for the first time digitize and make the collections available online. Although Federal Hall, a marble and granite monument, was on the cutting edge of fireproof buildings of the late 19th century, modern museum standards require an updated fire suppression system for the housing and display of important documents. 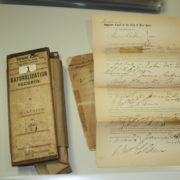 With support from the Lower Manhattan Development Corporation, we installed a new mist and chiller system which now allows us to display documents from our collection and to acquire items on-loan. New Fire Suppression/HVAC System. Although Federal Hall, a marble and granite monument, was on the cutting edge of fireproof buildings of the late 19th century, modern museum standards require an updated fire suppression system for the housing and display of important documents. 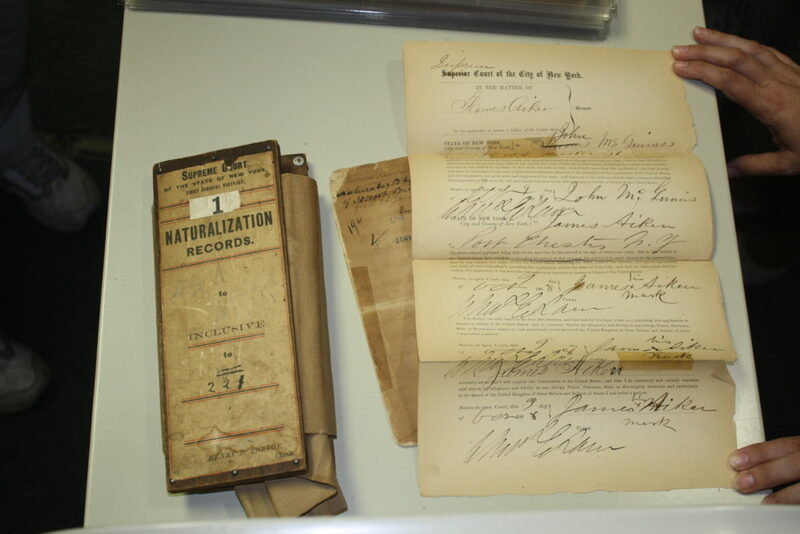 With support from the Lower Manhattan Development Corporation, we installed a new mist and chiller system which now allows us to display documents from our collection and to acquire items on-loan.